Lo Romero is located near Pilar de la Horadada on the provincial border of Alicante and Murcia. This new course opened in January 2008, and has been designed in such a way that it is perfectly suitable for golfers of all levels. The original flora at Lo Romero is well protected, and carefully typically supplemented with indigenous crops. Squirrels, partridges, rabbits, local bird species and migratory birds feel at home here. The course is very versatile, so make sure to bring all your clubs. 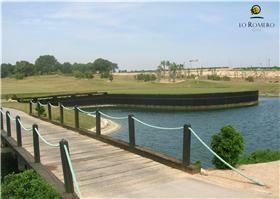 The spectacular trail has 57 very strategically placed bunkers, 8 lakes, and a beautiful rippling brook. 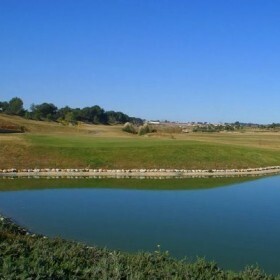 The first 9 holes are situated in a natural, sloping basin. The second 9 holes are built on the former orchards of an old “finca”, a large farm with citrus plantations. The green of Lo Romero’s natural flora contrasts beautifully with the bright blue horizon of the Mediterranean Sea, which divides La Manga and Mar Menor. Pay attention though! Because of the sea’s proximity, the wind might affect your end game. 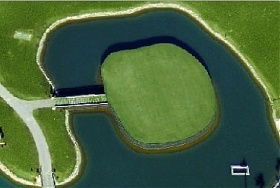 The 18th hole, a beautiful par 4 with an island green, is a challenge in itself. You wouldn’t be the first one to drop the ball in the water surrounding the green, with everybody on the terrace watching you.